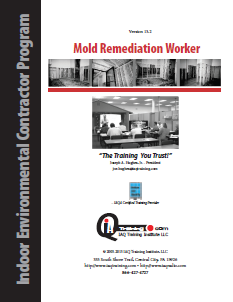 This manual is designed for those performing mold remediation under the supervision of an experienced mold remediation supervisor. This manual includes instruction on background information, health effects, mold remediation equipment & techniques, personal protective equipment and other safety hazards associated with mold remediation. This manual also helps prepare reader for the ACAC CRMR(Council – Certified Residential Microbial Remediator) exam. This manual is designed for those interested in providing indoor environmental quality (IEQ) investigations, reporting results and make recommendations for solutions in residential buildings. It provides the fundamental information necessary to perform many types of indoor environmental quality investigations including; moisture and microbial issues, allergens, toxic substances such as pesticides, and much more. There is no instruction on dealing with sound, lighting, ergonomics, electromagnetic fields and other less common IEQ related issues. 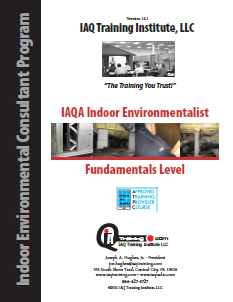 This manual is the next step for those taking the Indoor Environmentalist -Fundamentals level or can serve as a stand-alone manual for those with several years of experience providing IEQ consulting services. It is primarily focused on helping those providing IEQ consulting and/or those managing managing commercial buildings. Topics include: IEQ Investigations (commercial buildings), IEQ Guidelines/Standards/ Codes/Regulations, Industrial Hygiene & IEQ, The Science of IEQ & Building Science, HVAC (commercial buildings), IEQ Diagnostics & Sampling, IEQ contracting project supervision, IEQ report writing.